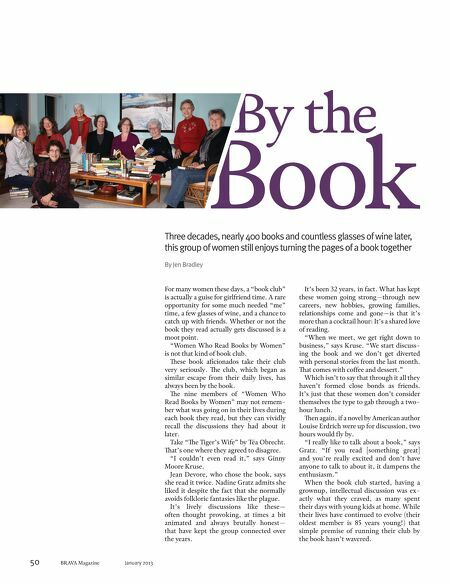 By the Book Three decades, nearly 400 books and countless glasses of wine later, this group of women still enjoys turning the pages of a book together By Jen Bradley For many women these days, a ���book club��� is actually a guise for girlfriend time. A rare opportunity for some much needed ���me��� time, a few glasses of wine, and a chance to catch up with friends. Whether or not the book they read actually gets discussed is a moot point. ���Women Who Read Books by Women��� is not that kind of book club. These book aficionados take their club very seriously. The club, which began as similar escape from their daily lives, has always been by the book. The nine members of ���Women Who Read Books by Women��� may not remember what was going on in their lives during each book they read, but they can vividly recall the discussions they had about it later. Take ���The Tiger���s Wife��� by T��a Obrecht. That���s one where they agreed to disagree. ���I couldn���t even read it,��� says Ginny Moore Kruse. Jean Devore, who chose the book, says she read it twice. Nadine Gratz admits she liked it despite the fact that she normally avoids folkloric fantasies like the plague. It���s lively discussions like these��� often thought provoking, at times a bit animated and always brutally honest��� that have kept the group connected over the years. 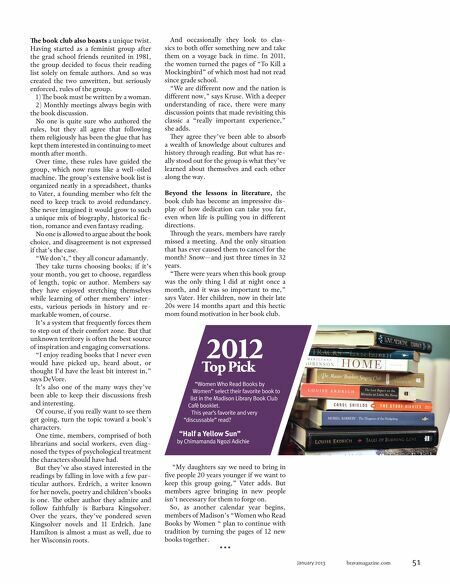 50 BRAVA Magazine January 2013 It���s been 32 years, in fact. What has kept these women going strong���through new careers, new hobbies, growing families, relationships come and gone���is that it���s more than a cocktail hour: It���s a shared love of reading. ���When we meet, we get right down to business,��� says Kruse. ���We start discussing the book and we don���t get diverted with personal stories from the last month. That comes with coffee and dessert.��� Which isn���t to say that through it all they haven���t formed close bonds as friends. It���s just that these women don���t consider themselves the type to gab through a twohour lunch. Then again, if a novel by American author Louise Erdrich were up for discussion, two hours would fly by. ���I really like to talk about a book,��� says Gratz. ���If you read [something great] and you���re really excited and don���t have anyone to talk to about it, it dampens the enthusiasm.��� When the book club started, having a grownup, intellectual discussion was exactly what they craved, as many spent their days with young kids at home. While their lives have continued to evolve (their oldest member is 85 years young!) that simple premise of running their club by the book hasn���t wavered.